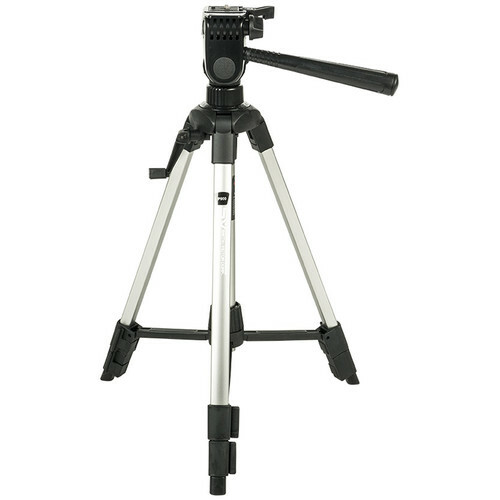 Max Height: 50.5", Min Height: 20.0"
This Smith-Victor P900 Pinnacle Tripod supports up to 5.0 lb, measures 20.3" when folded and includes a three-way, pan-and-tilt head. Its 3-section legs each feature flip locks for fast deployment, and can be positioned for a minimum height of 20.0" to a maximum height of 42.0", or 50.5" with its column fully raised. The column utilizes a geared movement for precise height adjustments and an integrated center brace allows the legs to be spread simultaneously as well as uniformly. The center brace helps to hold the legs in place, which include rubber feet to further enhance stability on a wide variety of surfaces. Cameras, sport optics, or camcorders that are compatible with a 1/4"-20 mount can be connected to the quick release plate, which is secured to the tripod's pan-and-tilt head using a quick release cam lock. The head can be rotated 360°, tilted 60° backwards, 90° forwards, or 90° sideways for portrait orientation. Both the 360° rotation as well as the backward or forward tilt movements function simultaneously and can be set in place using the pan bar's integrated twist lock. When changing from a landscape to portrait orientation, the sideways tilt can be independently adjusted and secured. Box Dimensions (LxWxH) 21.496 x 4.803 x 4.646"
P900 Pinnacle Tripod with 3-Way, Pan-and-Tilt Head is rated 4.0 out of 5 by 5. Rated 4 out of 5 by Anonymous from Overall Good Product, One Problem Overall the product is pretty good. Its light weight and folds small enough that I can carry strapped to my backpack with no problems. The only problem it that the extension mechanism on the neck of the tripod will move down even while locked. I would recommend this product for outdoor photography, but I would not recommend this product for photographing full body, it just isn't tall enough for options in photographing. Rated 4 out of 5 by Anonymous from Sturdy Tripod I purchased this product to use for night photography photographing the Northern Lights. I was impressed with how sturdy this tripod is. It is very portable and includes a 3 way pan and tilt head. It is easily adjustable. Great tripod for the price. Rated 4 out of 5 by Anonymous from Overall pretty good I thought the tripod was pretty good for standard use and is light weight which is handy. The only thing I can complain about is the lack of little metal spikes on the bottom to really hold it in the ground, but like I said, good overall. Rated 4 out of 5 by Anonymous from Good quality for the money I like this tripod it make for easy use. It has a crank arm to give you the ability to rise or lower the height just a little without having to readjust the legs which is great. Also it has a built in level for spot on pics. Rated 4 out of 5 by Bob Hannah from For an economical price, very sturdy and handy to carry. For an economical price, very sturdy and handy to carry. Will this tripod support a DSLR camera, such as a Nikon d5200? Yes, this tripod can support a DSLR. The P900 can support up to five pounds.